Early days after my son's birth, I used to struggle, when I have to go out with him. Struggle of collecting his required things, which he will need on the go. So when I have to go out with him, whether it be a visit to doctor, or outing of 2 or 3 hrs, or travel to another city, my planning get started much ahead of time. Like what are the things that my son will need in that hour or two or in that traveling duration, like medicine, diaper, wipes, etc...etc.... Within two or three outing with my son, I had realized that, I must keep handy some necessary things of him in my bag, so I don't need to invest my time on every outing. I have made list of those things for all lovely mothers. Extra pair of baby's clothes (in case baby wet the clothes or vomit on it), socks or booties, mittens, and cap to cover baby's head and ears. Baby teether, if teething of your baby is started. Tie it with colorful string that you can hold in your hand or tie it with baby's pram. So teether doesn't fall on floor. Prior to going out, last minute addition will always be there, like you need to take warm water if you are giving formula milk or baby food. Water bottle or sipper filled with water. It may possible that you have some more in your list, that you can share here in my blog comment section. This in turn will be useful for other mothers. Once, your baby is 1.5 years old, above list will automatically reduce, and other things will get included, like you should have with you small board book of animal, fruits, or vegetables to entertain your kid while traveling. Now where should we keep it ? You will say...of course ... in my handbag. Every ladies have their handbag, which they love so much, like I do 😍. Right, ladies !!! We love our handbag so much, that one or two will never enough. And when we go to out and see handbags shop, whether we need it or not we will surely go for window shopping of that. And who knows, we may be end up purchasing it😒. Husbands don't like it. But we are helpless on it 😁. On initial days after my son's birth, when we go out, I used to keep my son's necessary stuff in my lovely, fancy handbag. But ladies, I realized that our fancy handbag is not suitable to keep all required things of our baby. When I needed some thing for my son, it used to take lot of time in searching that in my handbag. I am sure, all mothers must have faced this problem. I had seen many ladies with bright colored, cartoon character printed soft bag in their hands along with their baby. So I realized that its now time to change your fancy handbag with Baby Diaper Bag. 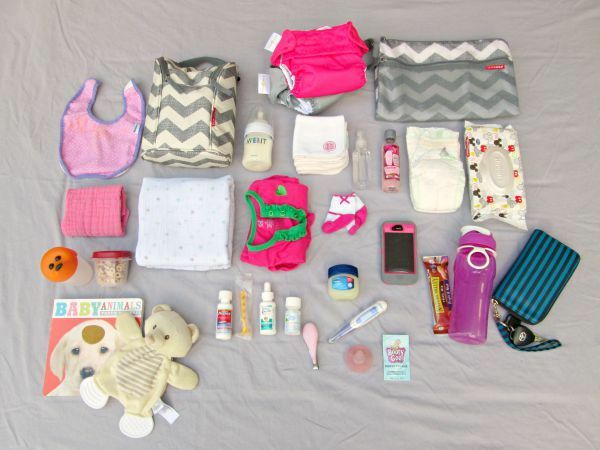 Yes it is called Baby Diaper Bag ! Wait...Wait...Don't judge it by its name. Its not the bag to only keep babies diapers 😉. It has all provision to keep all required things of baby. It have small, medium and large sized pockets in it. Most important it have many small and medium sized pockets and these too in such manners that things come so much handy when we need them with baby. Mothers, this is such a beautiful phase of your life, so why don't you enjoy it at fullest. Enjoy it with different kind of handbag !!! You can checkout some of them in above links. Since diaper bag will going to be your handbag for may be a year or more than that, you should keep in it other things which you going to need for yourself as well. Now you are sorted out. When you need to go out with your baby, you don't need to waste time in collecting needed things for baby. Just grab baby diaper bag, and you are done. And yes of course, keep checking on things in diaper bag at regular duration, like sanitizer is not finished, all diapers are not used, milk powder needs to be change etc... etc. If you need to travel out station very often with baby, then go for big size diaper bags, otherwise small or medium sized diaper bags are fine. Mothers, I hope my article will be helpful to you. I like to know your thought on this article. Please leave your comment in below comment section. Very useful for all mothers.. good 1..